Today's economic releases shed no new light on the state of the economy, which remains one of disappointingly slow growth. Although it's very clear the economy has slowed down, there are as yet no indications that it is going to slow further or enter a recession. 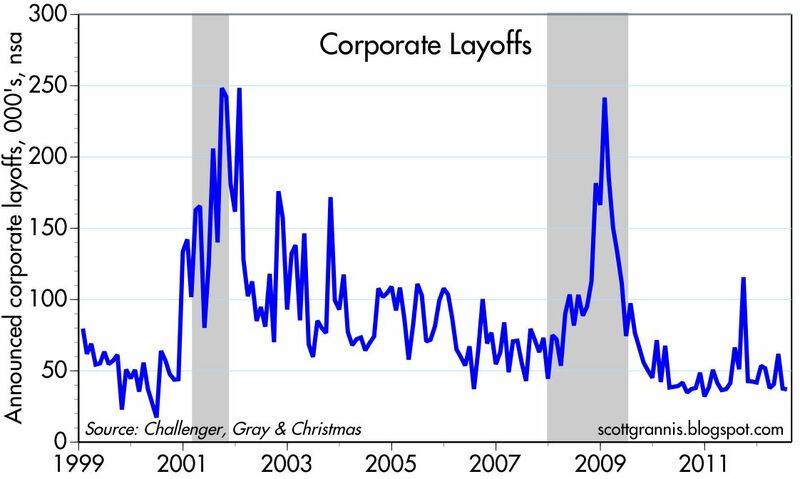 After a month of very volatile numbers, the picture of the weekly unemployment claims has clarified: the volatility was almost entirely due to seasonal adjustment factors—which attempt to predict the timing and magnitude of scheduled layoffs in the auto industry—that did not match up with the reality. By now, however, these problems are water under the bridge, and today's release is probably an accurate reflection of the underlying realities: new claims for unemployment continue to decline. 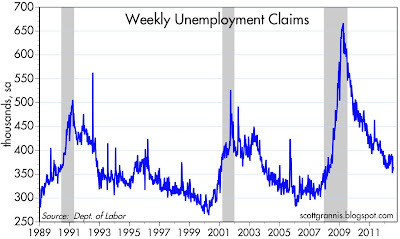 On an unadjusted basis, claims are down 9% from a year ago. This is important, since if the economic fundamentals were deteriorating, we should be seeing an increase in claims, not ongoing declines. The economy is growing slowly, but it is not deteriorating. 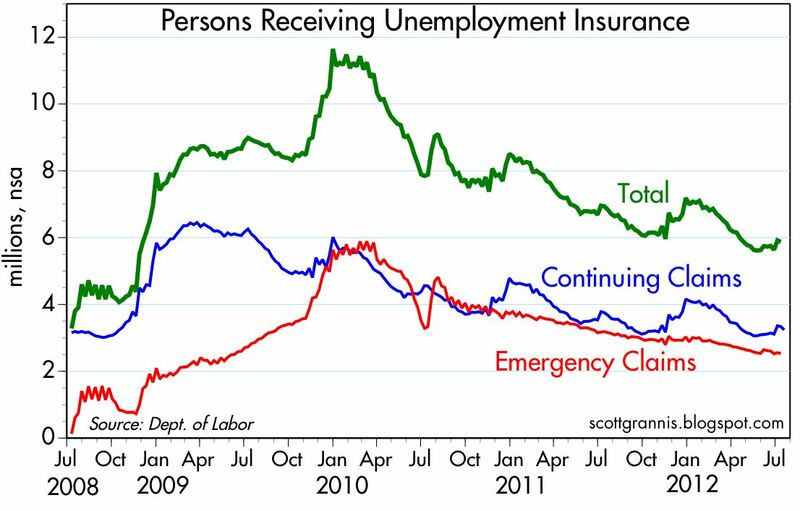 Thanks to the scheduled expiration of emergency claims beneifts, and to the ongoing decline in new layoff activity, the number of people receiving unemployment insurance continues to decline on a seasonally-adjusted basis: down over 1 million in the past year, or -15.4%. This creates important new incentives in the workforce, since more people have an incentive to find and accept job offers, even though they may not be ideal jobs. This—relocating workers to the areas of the economy where they are needed and adjusting the cost of labor to new realities—is part of the natural healing process of any recession, and it has been retarded for way too long by Congress' decision to keep extending eligibility for unemployment insurance. 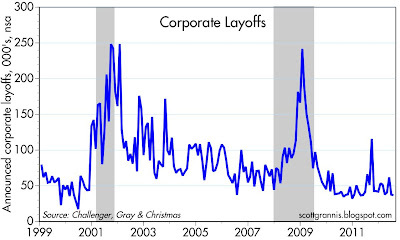 Announced corporate layoffs continue to run at very low levels. 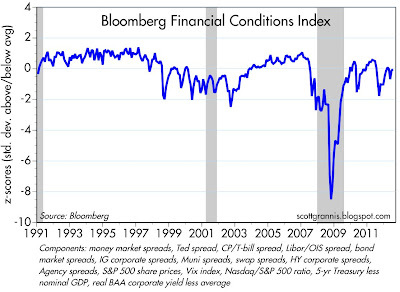 Once again, here is a key indicator of underlying economic fundamentals that shows no sign of deterioration. 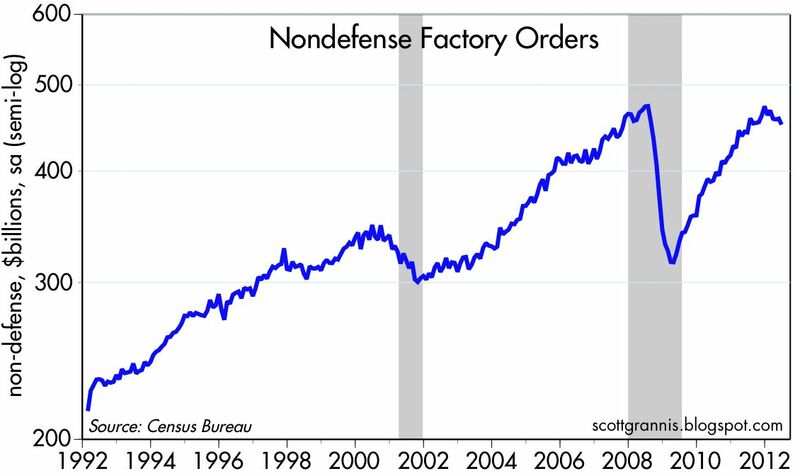 Nondefense factory orders declined in June, and they have fallen at a 9% annualized rate so far this year. The deterioration in factory orders and related subcomponents (e.g., capital goods orders) is mirrored in the recent decline of the ISM manufacturing index, and it reflects conditions that existed 1-2 months ago, so it is arguably not new news. 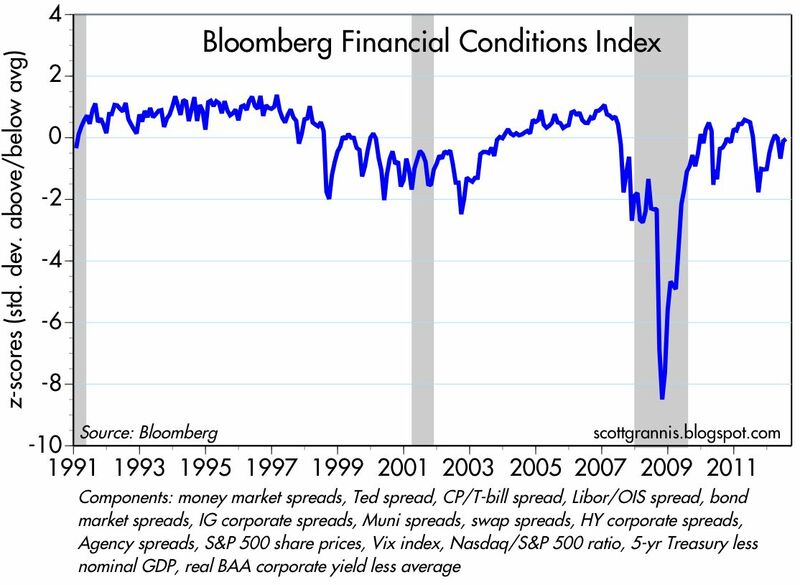 Key indicators of financial health and systemic risk, captured in Bloomberg's Financial Conditions Index (first chart above), are behaving in relatively normal fashion. The Vix index of implied equity volatility remains somewhat elevated, at 18.7, but swap spreads (second chart above) are trading at relatively low levels in the U.S. and are even down significantly from recent highs in the Eurozone. 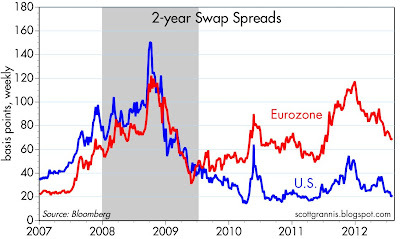 The market is still in the grips of fear, and risk aversion is still high (viz. 10-yr Treasury yields at 1.46%), but markets are liquid and functioning normally. Arguably, the illiquidity that struck markets in the wake of the Lehman collapse in late 2008 was a very important factor aggravating the recessionary conditions that had been building up to that time. With banks almost frozen, for example, letters of credit were almost impossible to get, and global trade virtually collapsed. Today's liquid and relatively tranquil market conditions show no signs of deteriorating fundamentals that might threaten the U.S. economy going forward. I am curious. What do you have to see to acknowledge there is signs of recessions? Just because data is equally bad as a couple of months ago, it means there is no recession? 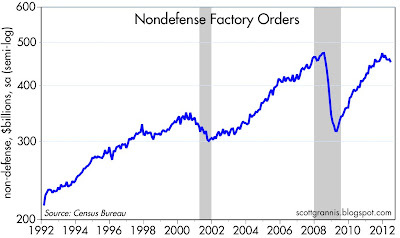 Factory orders falling at 9% annual rate. ISM below 50 two months in a row. Do you have to see ISM falling to 45 to have concerns about recessions? By then, everyone on the street knows recession is coming, doesn't it? A slowdown isn’t a recession. But the sharp decline of a lot of stats is an alert. In California I have said since Arnold failed shortly after he was elected, that once a corrupt liberal patronage system power structure reaches a critical mass, it cannot be undone, it can only collapse. In California, the teachers and public employee pension plans only have to submit a letter to the appropriate government official, and the Comptroller, by law, has to cut a check for billions of dollars to cover the short fall in the pension plans. There is no legislative action required. The pension plans will wait to do this until after the election in November in which Californians will approve tax increases in the belief the money will go to education. Won’t they be surprised that the new revenue will go to the pensions just like all new revenue does now. This is great day time TV exceeding the entertainment of the European channel. The manufacturing ISM has fallen below 50 for extended periods of time in the past without going into a recession. It spent 8 of 12 months in 1985 below 50 and we didn't go into a recession. It also spent considerable amounts of time in 1995-96 below 50 (going as low as 45.5) without the US going into a recession. If you don't believe me, you can view the data here. I believe you. Otherwise, I wouldn't say ISM falling to 45 means we are in a recession. But if you wait till ISM to hit 45 to declare recession, that's not much of a forecasting, is it? Any one can do that. A good economist should be able to look at a variety of things and see signs of turning points before other people do. Otherwise, it does not help anything. If you want to know the likelihood of us being in a recession *right now*, Hale Stewart here did a good job of looking over the data yesterday.